Our gymnastics program is designed to teach strength, flexibility and body awareness while building positive self-esteem in a fun yet challenging learning environment. Our non-competitive program is designed to build skills sequentially. Apparatus includes uneven bars, tumble track, vault, balance beam and mini-tramp. 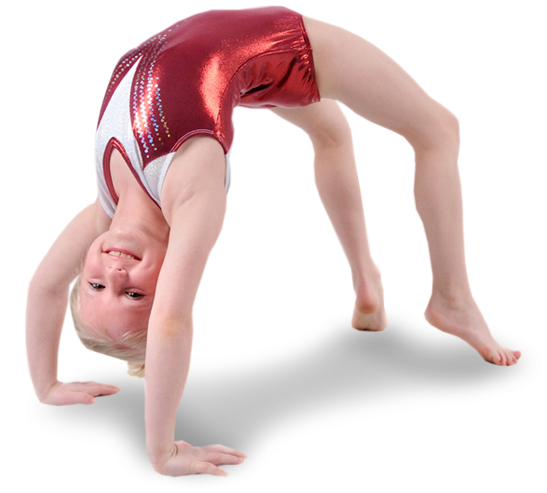 Our gymnastic studio in Indiana, Pennsylvania offers a wide variety of classes. TUMBLING TOTS - This is a 45 minute class designed for children ages 18 months to age 3. Parents participate with their toddlers, leading them through the activities focusing on listening, social and gross motor skills. PRESCHOOL-K - This independent class runs 45 minutes and is geared towards children ages 3-5 years. Preschoolers are learning to follow verbal directions, to take turns, and to develop fundamental gymnastic skills. BEGINNER - This one hour class gives 6-12 year olds the basic skills needed to become strong, healthy gymnasts. Warm-up activities vary from week to week, but center on developing balance, strength and flexibility. INTERMEDIATE - Gymnasts are sequentially progressing to more difficult and intricate gymnastic tricks. Students must be able to do one hand and switch leg cartwheels, handstand to a back bend and back handsprings with a spot. ADVANCED 1 & 2 - Gymnasts must be able to do a roundoff back handspring, front walkover, and back walkover with no spot. Gymnasts are learning to connect their most difficult tricks. CHEERNASTICS - Tumbling skills are the focus of this class geared toward cheerleaders. Classes focus on strength training and stamina, form and precision. Participants should be of intermediate level. CHEERING SQUADS - Elementary, middle school, varsity and all-star squads can learn to work as a team while perfecting their basic tumbling skills.